Wow...what a great opportunity to work on that!! Great job my friend. I can't wait to see more of your hard work come to life with you when the movie comes out! Coraline is so cute and i love father and mother's designs soo much! This looks really fantastic. I can't wait to see the whole film! I really can`t wait to see this amaizing movie, but I Never think about Henry Selick is the director woow!!! anyway, I want the Caroline doll in my room!She is Cute! Good to see you again Shane! This is just brillant! The designs look great, the backgrounds are awesome... and I loved the book. It's been a while since I haven't been that excited by a movie. Coraline rocks! And we are proud to watch it sir! Dude, this is so amazing, I can't wait for the movie to come out, it look so awesome! Can't wait Can't wait! You can be proud of your work, this movie looks like one of the most exciting thing i've seen in years. Thanks for the comment Mr.Prigmore. Congratulations on Coraline. It is a work of pure genius. Stop Motion stands out so uniquely and beautifully against a sea of the usual flash and computer generated stuff! Looks SO great. Was Tadahiro Uesugi involved at all, and if not, he must have inspired the look of that sparse forest with the square leaves. GORGEOUS looking film. You guys did an amazing job with the design. I thought I saw some of the these puppets at the show and was very impressed. Very cool stuff as always! Thank you for checking out my blog. I have always enjoyed your work so it's an honor to hear from you. Thanks again and keep inspiring us! you can be proud, I'm stuned by what we can see for now because of the art qualities as much as the technical part ! and by the way, thanks for your comment and your kind words. hey man ... cool u got the opportunity of working on thisproject .. looks prety cool to me ! Awesome! I can't wait for this one! Awesome Shane been hearing good things about this film. Excelent blog...love your work Shane. I am wicked excited to see this movie, must've been amazing to work on it! Thanks for the gentle comment.Much appreciated. I really like your work.I'm a great fan! !Your drawings are amazing. "Baseball" and "Oh my Zod" are my favorites.Full of life!Congrats!! I hope found you in my blog again.Thanks. Hey Shane - really excellent work here! 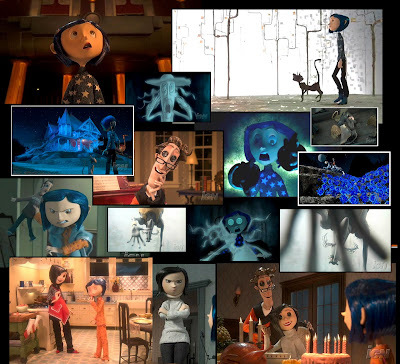 I posted a blurb about Coraline on our site, Motionographer, after reading this article. Can't wait for the release! I love Coraline from now, I´m hoping to see if she will have button eyes definitevely..
Hi Shane! Thank you very much for coming by, and leaving your comment! I was impressed with your work, and I sincerely hope that all your projects come about successfully. Thanks for stopping by hartercounty. These look great. How fun! I respect stop motion animation very much. These making - of clips got me SO freaking excited about this film! Honestly, Bobinski's design is one of my favorite I've seen in an animated film. Freaking so cool. Can't remember which one of you guys thought him up. Anyways, congrats, can't wait to see this... IN 3D!!! I got the sneak a peek at some of the sets when we were visiting up there last month. I gotta say, they were AMAZING, and I'm probably more excited to see this than anything else. It's gonna look sooooo cool! I'd like to use your art! Love your work Shane, fantastic character designs! that's cool~! I have heard of many different stories about this production, and it only heightened my expectation till now. I don;t know how you can work on all these different kinds of projects. thanks for visiting my blog. lloking forward to seeing coraline. keep up the great work! GReat design work! Cant wait to watch the film! Do you know which characters Kent worked on? Congrats for your work!!! Your illustrations are AMAZING! And like me, you are IDIANA JONES fan ! Everything I've seen on this looks so beautiful! I can't wait to see it!